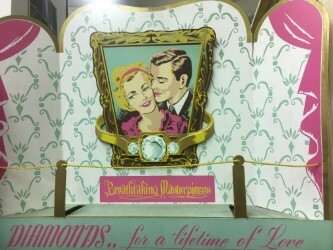 Diamonds… for a Lifetime of Love. Beautiful Masterpieces. Cardboard advertisement. – The American Treasure Tour is a trove for popular (and pop) cultural artifacts spanning the twentieth century, and the blog loves to talk about it all. One subject we rarely make the time to address is advertising. Americans are bombarded with jingles, ads, computer pop-ups, and other efforts to get us to spend our money every single day. Among the nickelodeons and art dolls displayed in the Music Room, there is a relatively small cardboard advertisement that has a drawing of a man loving on his woman, practically cocooned in a diamond ring that reads “Diamonds … for a Lifetime of Love.” Diamonds. Every woman’s dream is to have a diamond ring and, if her man truly loves her, he will give her at least one during her lifetime. At least, that’s what the ads tell us. This idea was fabricated by none other than the largest diamond-producing company in the world: the London-based De Beers Group of Companies. Founded by Cecil Rhodes (Ever heard of the Rhodes scholarship? The African countries called Rhodesia? That’s all from Cecil), and funded by the Rothschild family (conspiracy theorists love these guys!) as the De Beers Consolidated Mines in 1888, De Beers dominated the market in diamonds. Their concern over competition led to the acquisition of 90% of the diamond production in the world, but, despite their dominance of it, they still needed to ensure that people wanted what they sold. So, they hired the N.W. Ayer & Son advertising company to establish a worldwide need for diamonds. Ayer coined the phrase “Diamonds are Forever,” and convinced both women AND men that love could only be proven with the gift of diamonds. Not rubies or any other precious gems. Just diamonds. The continued success of advertising campaigns such as this one show how responsive we humans can be to suggestions. Now, if you you’ll excuse me, I need to get my wife a diamond ring….